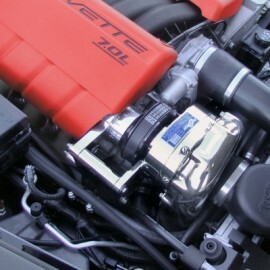 ProCharger now has 100% complete HO Intercooled Supercharger Systems available for 2006-2013 model year LS7 ZO6 Corvettes. This new system is capable of producing 700+ crankshaft horsepower on stock motors running pump gas. The HO Intercooled System includes the industry standard P-1SC-1 ProCharger with patented and proven self-contained oiling, billet impeller and transmission case, a highly effective air-to-air intercooler system, and OEM quality brackets, hoses/tubing connectors and all necessary installation hardware. The ProCharger supercharger and brackets are provided with polished finish standard. For those with modified applications, a ProCharger HO Tuner Kit for 2006-2009 GM LS7 Z06 Corvettes is also available. The Tuner Kit is complete with the exception of fuel injectors and tuning. In addition to the largest power gains and coolest charge air temperatures, this bolt-on ProCharger kit also features the quickest and least costly installation of any forced induction system. Thanks to industry leading technology, at the same boost level a ProCharger kit can produce more power at the rear wheels than other supercharger systems produce at the crankshaft. * higher boost levels represent Tuner Kits only and are available with P-1SC-1 and an Tuner Kit upgrade to a D-1SC ProCharger. The F-1C is a custom application for the LS7 Z06, for modified motors only.